Renovo Vinyl Cleaner (500ml) deep-cleans heavily soiled vinyl and vinyl coated fabric tops, boat covers, motorcycle covers and RV covers. It will safely and effectively remove imbedded grime, tree sap and bird droppings. Brush or sponge on a thin coat, allow it to clean for a few minutes, gently scrub with a sponge, soft cloth or soft brush to loosen stubborn dirt, rinse thoroughly with water to remove all traces of cleaner and then dry. Heavily soiled or surfaces with deep graining may require the cleaner to work for up to an hour, before rinsing, and gentle brushing with a soft bristle brush to remove the imbedded dirt. Immediately remove any drips on paint, glass or trim with a wet cloth. 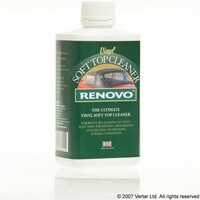 Once the clean top/cover has completely dried, follow immediately with an application of Renovo Vinyl Ultra Proofer. Always test a small area prior to use to insure colorfastness of the material. I was sceptical but results unbelievable ! You may recall I purchased the above recently. Anyway, this is just to say how thrilled I am with the results! I have a 1972 Triumph Spitfire MKIV and the hood was faded with U/V damage and looking very tired and worn. I had little hope but to replace - so I thought. I saw your product and decided to give it a go. I used the cleaner (as instructed) twice and also got hot, soapy water to follow up and lots of elbow grease. The result was a faded and worn BUT clean hood on which to begin protecting. I still had little hope. Anyway, I applied the Protector with a brush and left it to dry overnight. The results were very encouraging so I applied a second coat. Well - after a third coat, the hood looks like brand new!!!!! I am amazed how well it has turned out and cannot thank you enough - it's brilliant! I don't have photographic evidence of the 'before and after' sadly but I am 100% accurate in saying the transformation has been UNBELIEVABLE. Used on very old vinyl roof of my Austin Ten. Initially disappointed with the product as it didn't seem to lather up or do anything except just lie on the surface. BUT after sponging down, I looked in the bucket and the water was BLACK !